A helicopter pilot with the munchies landed his chopper next to a McDonald’s to grab some food. 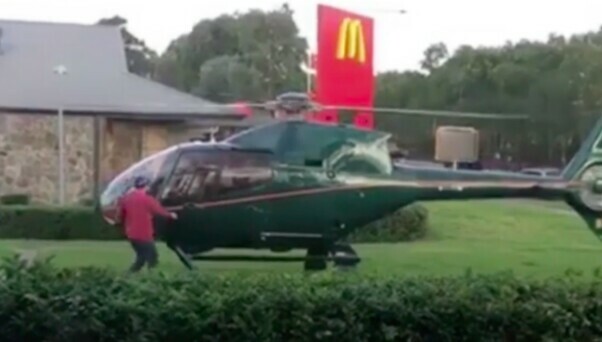 At approximately 4:20 pm (seriously) on Saturday, a pilot landed his his chopper onto the lawn next to a McDonald’s in northwest Sydney, got out of the aircraft, entered the restaurant to get food, got back into the helicopter, and flew away. But in the modern day of documenting every single thing that you do, the man snapped a photo of his chopper in front of McDonald’s before flying away, because stories. Nope. Dude just wanted some Macca’s. According to 9 News Australia, concerned citizens sent the news outlet a video of the incident, and although it’s bit unusual, the landing may not have been illegal. The Civil Aviation Safety Authority says that as long as the pilot had the permission of the land owner, the pilot could technically use it to land his aircraft and get some grub as long as it was safe. The agency is currently investigating the incident in order to determine if the landing and takeoff were safe enough.